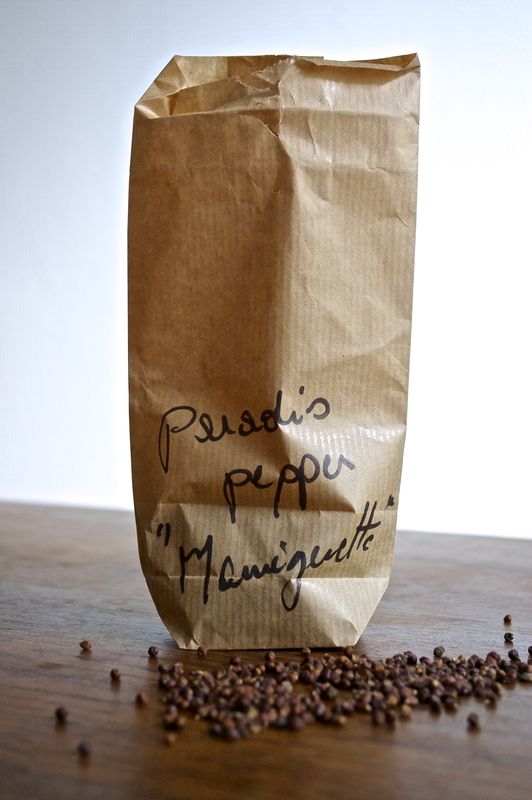 Our most-recent culinary discovery is poivre maniguette, a spice in the ginger family that has the same fiery property as pepper. Also known in French as poivre du paradis (Grains of Paradise) or poivre de Guinée (Guinea Pepper), Meleguetta Pepper is grown on the Western coast of Africa and is used in many traditional African dishes. It has a slight citrus flavor as well as a hint of cardamon. This spice is supposedly both a stimulant and a diuretic. 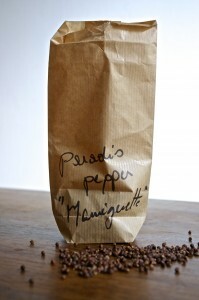 We came across Melegueta Pepper at an outdoor farmers’ market near Bordeaux during our summer vacation. The spice vendor recommended it to replace the basic pepper we usually use, saying it went well with many dishes, from fish to meats and vegetables. The best, he confirmed, was to pair the spice with pears and chocolate. Apparently, Grains of Paradise were already known by the Ancient Greeks and Romans, but became most popular in Medieval Europe. It was brought to the continent by Arab traders and used, for example, in traditional alcoholic beverages, such as Hippocras spiced wine. The popularity of Grains of Paradise waned in Europe as pepper and cloves became more and more prevalent. We ground the seeds using a pepper mill and used them in a variety of dishes during vacation. It was especially nice over grilled dauradine (a small version of sea bream caught fresh from the Atlantic coast). We also enjoyed it over warm goat cheese in a salad, and even for dessert sprinkled over strawberries. This entry was posted in What's a...? and tagged dessert, fish, markets, salads, spices. Bookmark the permalink.